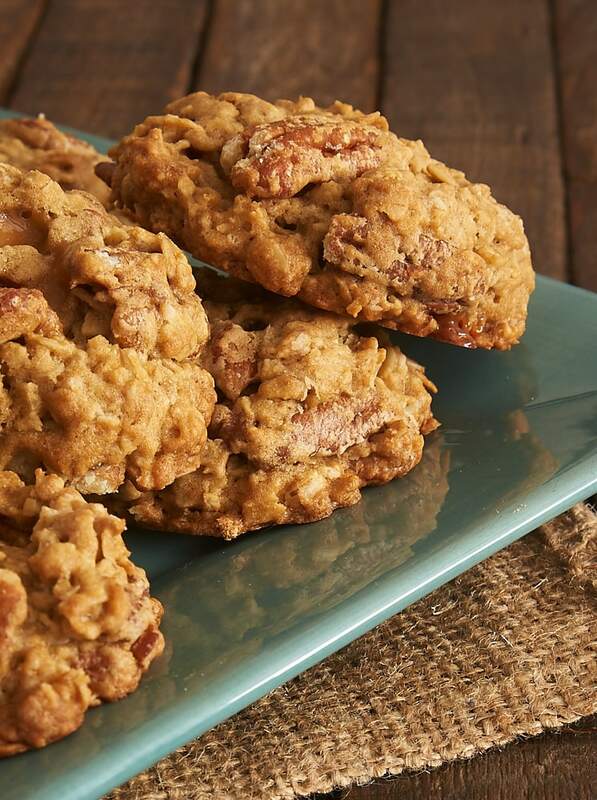 Butter Pecan Oatmeal Cookies add sweet, toasted, buttery pecans to a hearty oatmeal cookie for a wonderfully chewy, nutty cookie. I’m not a fan of fussy recipes. You know, the ones that have a few steps in the directions that just seem unnecessary. But sometimes there’s that one extra step in a recipe that takes it from pretty good to pretty amazing. That’s the situation with these cookies. Sure, you could just add some pecans to the dough. But taking a few minutes to toast those pecans in a little butter and sugar makes them so much better that it’s worth that bit of extra effort. Not only do you get a great toasted flavor, but you also get a little extra bite of sweetness and butteriness. I should also probably mention that these buttery, sweet pecans are also quite good all on their own. You might want to take that into consideration and just make extra for snacking. I must confess that not quite all of the ones I made for this batch made it into the cookies. 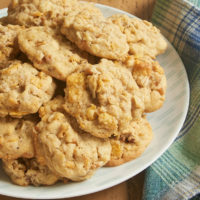 With those sweet, toasty pecans and lots of brown sugar in these cookies, the addition of a little bit of caramel to the batter enhances the flavor and adds chewy bites throughout the cookies. Store-bought soft caramels cut into small pieces are such a simple way to infuse a little extra caramel flavor into these delicious cookies. I use a 3-tablespoon scoop for forming the cookies. I like the uniformity of cookie size and shape for even baking. Whether you use a scoop or not, those big pecans in the dough can make forming the scoops a little tougher. Just make sure the scooped dough is not too loosely formed, and they’ll turn out just fine. I bake a lot of cookies. 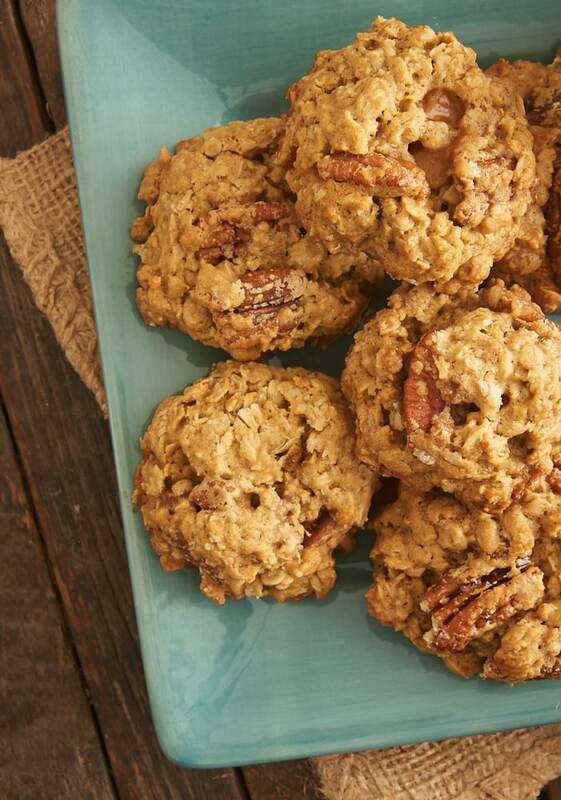 But I must say these Butter Pecan Oatmeal Cookies are now one of my favorites. I just love their big flavor! These are some serious cookies, my friends. They’re the perfect blend of chewy, nutty, and sweet in a big, bakery-sized cookie. 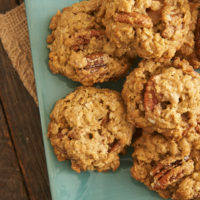 These big, chewy, hearty oatmeal cookies are filled with sweet, buttery, toasted pecans and little bites of caramel. Melt 2 tablespoons of butter in a large skillet over medium heat. Add the pecans, sugar, and salt. Continue cooking over medium heat, stirring frequently, until the pecans are toasted and the sugar sticks to them (about 7 or 8 minutes). Set aside to cool. Reduce the mixer speed to low. Gradually add the flour mixture, mixing just until combined. Stir in the pecans and the caramel pieces. Drop the dough by 3-tablespoon portions onto the prepared pans, leaving about 2 inches between cookies. Flatten the top of each cookie slightly. Bake 12 to 16 minutes, or until the edges are browned. *I use mostly pecan halves, but it’s fine to have some smaller pieces as well. The weight is an estimate, as it will vary deepening on your ratio of halves to pieces. ** I recommend cutting each of the caramels into several small pieces. I usually make two parallel cuts and then 2 cuts perpendicular to those to make 9 smaller pieces (like a hashtag). Larger pieces of caramel tend to harden up in the cookies after they’re baked. If you have access to caramel bits, these should work, too. You’ll need about 2 ounces, or about 3 to 4 tablespoons. These look perfect for my dad’s birthday! Do they taste like the ice cream? The buttery pecans are reminiscent of the ones in the ice cream. Will leaving out the caramel affect the taste or texture in a big way? Its an icy day here in MD and I have all the ingredients on hand except the caramels. Thanks! 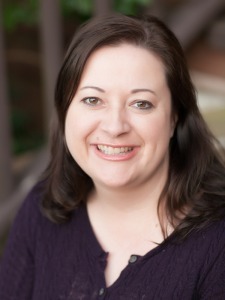 Hi, Leigh! You can leave out the caramels. You could add a few more pecans to make up for the volume. Otherwise, you’ll have a slightly smaller yield. Could you use a couple of tablespoons of caramel sauce instead of the caramels? Hi, Eileen. I think that would work. It could change the consistency of the dough, so I wouldn’t use more than a couple of tablespoons. These sound amazing! They are on my schedule for tonight! Had me at Butter Pecan. . .
As usual you nail a flavor and texture that sounds amazing and will be loved by all my folks who get some baking. 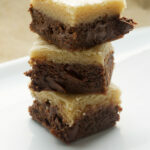 The hardest part with your recipes is narrowing it down to ONE to make instead of 10. HAHA I really like this one. But then…I seem to like all your recipes and I’ve never had one disappoint me (or the eaters!). Thanks, Jennifer!! I did make these today. I don’t tend to make cookies as large as yours. I made a few changes to fit my size (#100 scoop). I used TJ’s dry-roasted pecan pieces and did a lighter touch with the toasting since mine were already toasted. I left them to cool and dry a bit overnight. My biggest problem was the caramel bits. Too large to distribute them well so I just placed one on each cookie top before baking. That way I assured caramel with each cookie. Other than those changes I stuck to the recipe. They look and smell amazing!! Thanks again!! 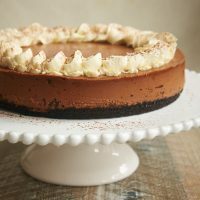 Hello Jenifer as i saw image of your recipe it seems halves pecan will be best .As it contains butter i would say there will be great tummy tickling experience after eating them. Just made these. Did not have caramels but these are great and easy to make. oooooh yes I know that the extra step for these pecans must really put the cookies over the top!! LOVE ’em, pinning! I used to leave out the salt in every cookie recipe because a friends Mom told me to. Now I use more of it to make a salty sweet cookie. Delicious!!! 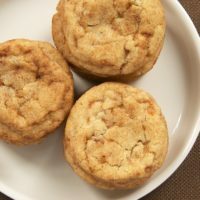 going to try these minus the caramel, as butter pecan is one of my daughter’s favorite flavor experiences, but she’s allergic to milk, even baked. Hoping it turns out well. I made these and it was hard not to eat all the sugar coated pecans prior to mixing in the better. These are very good and the only thing I did differently was I substituted Heath toffee bits for the caramels,,,very good! Did the toffee bits work out? Yes the toffee bits worked fine…cookies are delicious and addicting. I used 3-4 TBSP and could probably get away with using more. In my above comment…sorry, typo on the word better…should be batter….oops. They are delicious and I gave some to my Dr and to the people in the Post Office, because they do their job so well. 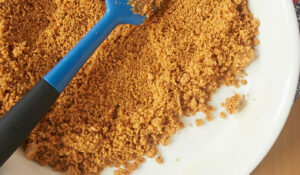 Can dark brown sugar be used instead of light brown? Hi, Bertha. Yes, you can use dark brown sugar. I made this recipe today and I found it to be rather bland. I was a bit disappointed. This recipe sounded like it had potential… It wasn’t very sweet at all. 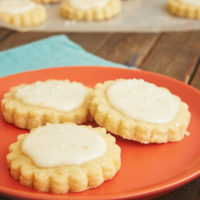 Since getting this recipe in my inbox on Friday I have made these cookies twice already and everyone just loves them. Toasting the pecans in the butter and sugar make them magic. Thank you for such a great recipe . These cookies are going into my repertoire now. I’m so glad they were a hit, Janet! Caramel in the cookies? Yes please! Yay for toasted pecans too. Such a necessary step. Did you know that Kraft makes caramel MORSELS? 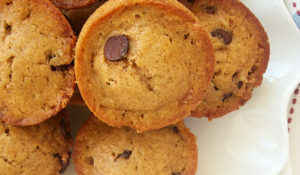 They are the size of chocolate chips and are fantastic in cookies. Look for them where you find chocolate chips! I’ve used caramel bits before, but I’ve not yet seen caramel morsels. I’ll be on the lookout! 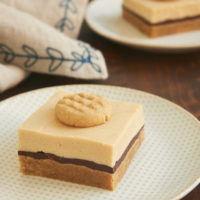 I am definitely going to make these soon. We have a bunches and bunches of fresh PECANS, this recipe came at a perfect time. We also ship pecans all over the US just in case anyone is interested. I am interested in the pecans, how much do you charge, how big a bag and are they large or small kernals? I like raisins in oatmeal cookies. Do you think I could add some to these cookies? I made these for a Soldier friend, but I dipped half of each cookie into melted Chocolate. He said they were great. You can, but the texture will likely be a bit different. Could you use butterscotch chips instead of the caramel? 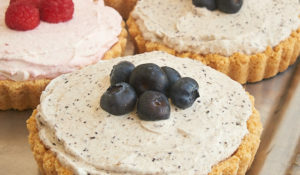 I just made these today, they are delicious! The sugared pecans are to die for. Thank you for the recipe. I’m so glad you liked them, Lisa! I wish I’d never made these! I can’t stop eating them! My favorite cookie has always been oatmeal cookies. Give me a choice between a chocolate chip cookie and an oatmeal one, oatmeal cookies are my choice, even as a child! But these have taken my love for oatmeal cookies over the top! Excellent in every way! The time it takes to glaze and toast the pecans is definitely worth it! I dropped my caramels in the flour mixture to make them easier to cut and so they didn’t stick together in the dough. I have two cookies left and I’m trying to convince myself NOT to make another batch today. Thank you for this amazingly delicious oatmeal cookie! That’s so great to hear, Dedee! These cookies definitely fall into the “dangerous to have around” category for me, too.